Christiane Nüsslein-Volhard won the Nobel Prize in 1995, the sixth woman to do so. She was awarded the Prize on the basis of her groundbreaking research that showed how genes regulate the early development of fruit fly embryos. Her discoveries helped create the new discipline of developmental genetics and laid the foundation for understanding genetic defects in human embryos. Neither of Nüsslein-Volhard’s parents were pushy as parents, but they expected their offspring to do well in school. 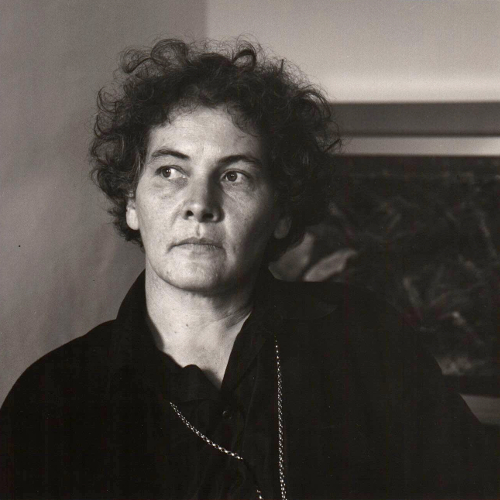 Nüsslein-Volhard was close to her father and he took a keen interest in everything she did. She remembers, for example, him listening patiently to her explanations of what she was doing in mathematics and taking time to discuss Goethe’s scientific papers with her. Sadly he did not get to see Nüsslein-Volhard go to university because he died suddenly in February 1962, the day she did her last high school exam. Looking back she sees the secret of many successful women is having had a father who encouraged them. (van Bredow and Kullman). While Nüsslein-Volhard enjoyed school and was recognised by her teachers to be an exceptional student, she seldom expended any effort and time on subjects that did not interest her. Her laziness in certain subjects was reflected in her final exams. She gained the lowest possible grades in Latin and physics and almost did not pass English. By contrast she was awarded high grades in German literature, mathematics and biology. These were her favourite subjects. She was fortunate to have inspiring teachers for all three of the subjects, most of whom were women. Nüsslein-Volhard particularly enjoyed learning about animal behaviour, genetics and evolution, topics her biology teacher introduced her to in her final year. By the end of her doctorate, Nüsslein-Volhard began hunting for a fresh challenge. Based on her discussions with colleagues, she decided to switch to developmental biology. What interested her was finding morphogens, factors present in a fertilised egg that direct the development of an embryo. Drosophila, a fruit fly species, offered the best model for working on the issue. Scientists had been studying the fly for over a century to understand genetics and a range of other biological processes. The fruit fly is attractive for several reasons. Firstly, its is easy and cheap to maintain in the laboratory. Secondly, it has only a small number of chromosomes allowing for sophisticated genetic experiments. Thirdly, it has a short life-cycle. Finally, the fly produces large numbers of eggs that develop externally and hatch into segmented larvae within 24 hours. Knowing very little about Drosophila or developmental biology, Nüsslein-Volhard approached Walter Gehring, a specialist in the area, based at the Biozentrum, the University of Basel, to become a postdoctoral researcher in his laboratory. Supported by a long-term fellowship from the European Molecular Biology Organization (EMBO), Nüsslein-Volhard began work in Gehrings laboratory in early 1975. Life in the laboratory was not easy at first because Nüsslein-Volhard was a novice at everything. But she soon picked up the genetics of Drosophila from colleagues and developed a number of tools to investigate embryonic development of Drosophila which at the time was not yet well known. She used these tools to isolate and study gradient mutants. In fact she found the flies so fascinating she began to dream about them at night. (Nüsslein-Volhard, 1995). In 1977 Nüsslein-Volhard returned from Switzerland to Germany to continue her studies in the laboratory of Klaus Sander at Freiburg University who was an expert in embryonic patterning, the complex developmental process that helps transform a single-celled embryo into a finished multicellular organism. Sander was famous for being the first to describe morphogen gradients in the insect egg. Together with Margit Lohs-Schardin, Nüsslein-Volhard constructed a fate map of the Drosophila embryo and worked on the first gradient mutant involved in embryonic patterning in Drosophila which she had isolated in the Basel lab (Nüsslein-Volhard, 1995). Nüsslein-Volhard left Freiburg in 1978 to set up a fly lab in the newly founded European Molecular Biology Laboratory, EMBL, in Heidelberg. This she did with Eric Wieschaus, a colleague she had met when in Basel. Sharing the same research interests and a technician, Nüsslein-Volhard and Wieschaus set out to identify the genes responsible for the initial developmental decisions of the Drosophila embryo. The aim was to mutate the genes at random and select the mutants that displayed an abnormal larval body pattern. Mutation rates were increased by feeding males with a potent agent for generating mutations and families set up which, after several generations of inbreeding, were scored for producing mutant embryos. Nüsslein-Volhard and Wieschaus then investigated the segmented pattern of mutated embryos for changes. This they did simultaneously using a dual microscope that allowed them to study each specimen together. Within three years Nüsslein-Volhard and Wieschaus had scored approximately 20,000 mutated families and collected about 600 mutants with an altered body pattern. Overall, they found that out of the approximately 5,000 genes that are essential for the survival of the fly, only 120 were important for the early developmental decisions. This collection of genes provided the basis of many further investigations in their and other laboratories, substantially contributing to the foundation of a new discipline, developmental genetics. (Wieschaus, Nüsslein-Volhard) A first report of the results describing 15 genes that control the formation of the segmented pattern of the Drosophila larva was published in Nature in October 1980. (Nüsslein-Volhard and Wieschaus). By September 1992 Nüsslein-Volhard had 7,000 aquaria filled with fish in her laboratory and a team of 12 researchers. They systematically induced and isolated mutants with altered development as had been done before with Drosophila. (Resnik, May). This was a huge undertaking. It necessitated crossing mutagenised males with wild-type females and then mating the offspring to establish families and scoring their progeny for abnormal development during the first 5 days after egg deposition. By March 1994 the group had screened almost 4000 families. The team identified nearly 1200 mutants that affected the appearance of the fish larvae. (Nüsslein-Volhard, 2012). More recently her lab focused on the formation of the adult colour pattern of the fish with the aim of advancing the understanding of the genetic basis of the evolution of the form and structure of organisms. In 1995 Nüsslein-Volhard was jointly awarded the Nobel Prize in Physiology or Medicine together with Eric Wieschaus for identifying genes that control the development of the segmented pattern of Drosophila. They received the award together with Edward B Lewis, an American geneticist whose independent study of fruit flies at the California Institute of Technology established a cluster of genes that function as master regulators of the development of the embryo. By the time of the Prize was awarded it had become clear that many of the genes that Nüsslein-Volhard and Wieschaus had discovered were conserved in organisation and function in all multicellular animals. (Mancini) The Nobel Committee awarded the Prize on the basis that the scientists’ findings in Drosophila could pave the way to discovering genes that cause birth defects in humans and help understand the reasons behind miscarriage and improve the success rate of in-vitro fertilisation. Nüsslein-Volhard was the sixth woman, the first German one, to win the Nobel Prize. In addition to her pioneering work on Drosophila, Nüsslein-Volhard is known for the breakthroughs she made with the zebrafish. (Nüsslein-Volhard, 1995) Following her research, zebrafish became a standard vertebrate research model throughout the world. It has proven useful because it shares many similarities in terms of body organisation with mammals, including humans, but unlike mammals is ideally suited for research, in terms of rapid embryonic development outside the maternal organism in large transparent embryos. (Resnik, May). This profile was written by Lara Marks with generous input from Christiane Nüsslein-Volhard. Brown, K, ‘An interview with Christiane Nüsslein-Volhard’, Development , 144 (2017), 3851-4. Dreifus, C, ‘Solving a mystery of life, then tackling a real-life problem’, The New York Times, 4 July 2006. Driever, W, and Nüsslein-Volhard, C, ‘A gradient of Bicoid protein in the Drosophila embryo’, Cell, 54/1 (1988), 83-94. Driever, W, and Nüsslein-Volhard, C, ‘The bicoid protein determines position in the Drosophila embryo in a concentration-dependent manner’, Cell, 54/1 (1988), 95-104. Mancini, E, ‘The female Nobel winner: The enduring inspiration of that rarest of scientists’, Times Higher Education Opinion , (29 Sept 2017). Nüsslein-Volhard, C, ‘The zebrafish issue of Development’, Development, 139 (2012), 4099-103. Nüsslein-Volhard, C and Wieschaus, E ‘Mutations affecting segment number and polarity in Drosophila’, Nature , 287 (1980), 795-801. Resnik, J, May, C, ‘Christiane Nusslein-Volhard (1942- )’, The Embryo Project Encyclopedia (16 Feb 2012). von Bredow R and Kullmann, K, ‘Women are just as gifted in science as men', Spiegel Online (20 Aug 2015). Wieschaus, E F and Nüsslein-Volhard, C, ‘The Heidelberg screen for pattern mutants in Drosophila: A personal account’, Annual Review Cell Developmental Biology , 32 (2016), 1–46.